The Mahadurgeshwar installation was memorable too. 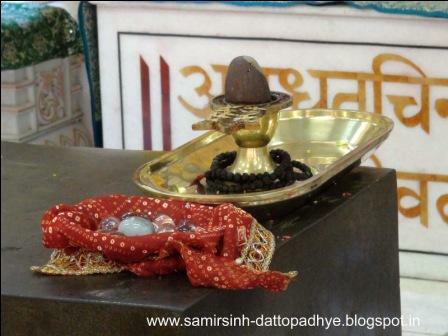 The Mahadurgeshwar Linga is extremely pure and sacred and is the foremost Jyotirlinga of the Kaliyug. This is the Stree-ambikeshvar and its poojan has to be offered in an appropriate way. Bapu often talks about the purity of purpose and of the means as also of the fulfilment of the purpose to accomplish a task. The Jyotirlinga, before it is installed ought to be with a purohit for at least a month, was Bapu’s wish and so it came to our home. We were of course instructed about how the poojan was to be offered. At 3.30 in the morning on the day of the installation, the linga was brought to Bapu’s house from ours. Sameerdada, Paurassinh and Swapnilsinh had to offer the Dandavat 7 times from the main gates of the Gurukshetram to the place of installation after which they could take darshan. It was not just offering the haldi kumkum. A proper procedure was followed. The parikrama (going round the sacred idol) was offered around Happy Home. Drums and other instruments were played. The Jyotirlinga was installed. Paurassinh and Nishthaveera did the Navachandi Yaag Anushthan. Bapu was consulted on all topics and meetings were conducted. Aai said, the motive was to list out all requirements, assign jobs, delegate work to people so that the preparations are accomplished before hand and nothing remains to be done at the last moment. This diverts the attention and we do not want it. We want everyone to have work behind them and relish every moment of the poojan. 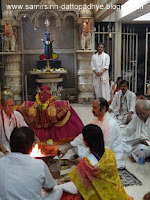 Aai Herself sat with sacred work while the Saptashati Paath was being performed. Bapu too sat during the havan. Each person observed the poojan keenly. What is the panchopachar or the shodashopchar poojan? The fire that is created during the poojan procedure is called ‘Airani’. Any poojan stretching over 3-4 days includes the Airani Manthan. Aai was always present and explained to the others, which kind of wood would be held on top and which one below it to be rubbed against each other causing friction and eventually fire. आज बापूंनी (अनिरूद्धासिंह) श्रीमूलार्कगणेशाला स्वत: उपरणे अर्पण करुन पूजन केले. 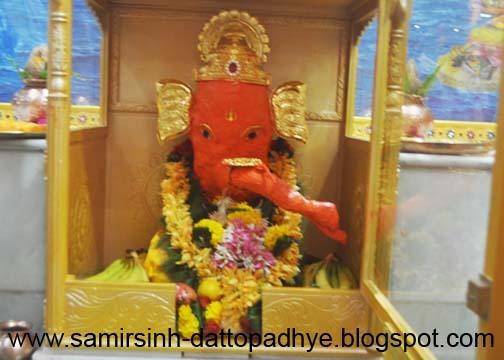 बापूंनी अर्पण केलेल्या उपरण्यासहित श्रीमूलार्कगणेशाचे फोटो या पोस्ट बरोबर देत आहे.